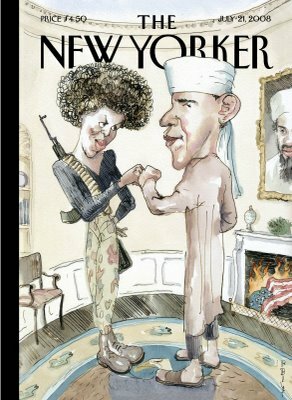 For those of you who’ve not seen it, the above is the infamous cover of the New Yorker, portraying Barack Obama and his wife the way his defamatory enemies have been intimating. Of course, it’s satire. But many don’t seem to realize this. Love him or hate him, you have to admit that he comes across quite Presidential in that clip. What’s interesting to me, though, is the way the Right Wing blogosphere erupted over the cartoon “controversy”. The Village Voice has a good summary of the trend here. Meanwhile, my Vista fatigue reached a fever pitch last night. I tried to remove Vista and install XP over top of it. However –get this– Vista would not let me delete the partition on which it was installed! I’ve never seen this before. Now, I’m sure I could have used another utility to get the job done, but I took this as a sign that I should try something a little less drastic. So, instead, I’ve used HP’s reversion function to revert to a factory installation setting for Vista. After re-installing some software, I am suddenly re-infected with Trojan Vundo, which is what started this fiasco in the first place. And that’s where we sit. Stay tuned.